Experience in medical services, we become famous among foreigners and locals alike for Genaral Medicine and is now considered the highest levels of international standards for treatment, care, and accommodation and through acquiring a multilingual staff such English, German, Italian, Swedish and Japanese languages. We always strive to attain our organizations prime goal "a delivery of quality service & care to all our customers' complete satisfaction". With our commitment to provide medical services to the highest internationally accepted standards. 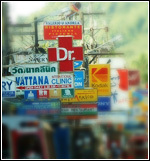 The Wattana Clinic established since 1987 was opened in Patong Beach and became the first local clinic to have served over 5,000 local resident and tourist patients. After that the Wattana International Clinic was formed in 1997 and is now it can provided all kind of Medical Services and Treament. Inculde newest equipped. For investigation and Medical Technicians specialized technicians specialized in its own field of expertise coupled with modern day medical technology and equipment.